It was such a gorgeous day in Sydney today. The sun was shining, the birds were chirping, yes even the Black Cockatoos were out and to my pleasant surprise the blooms are, well… blooming too. I wasn’t expecting quite as much action when I ventured out to the garden today. 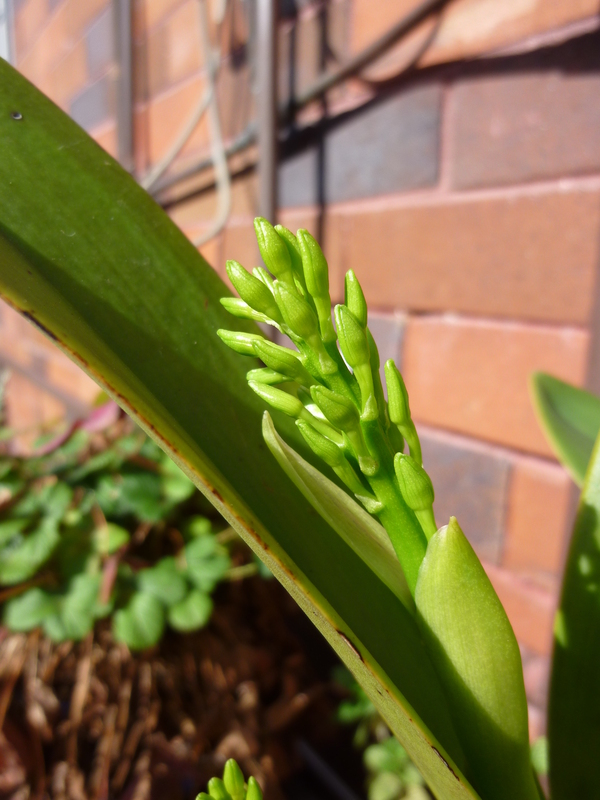 There had been hints that one of the native Orchids was going to produce a flower spike – never before seen in our garden. 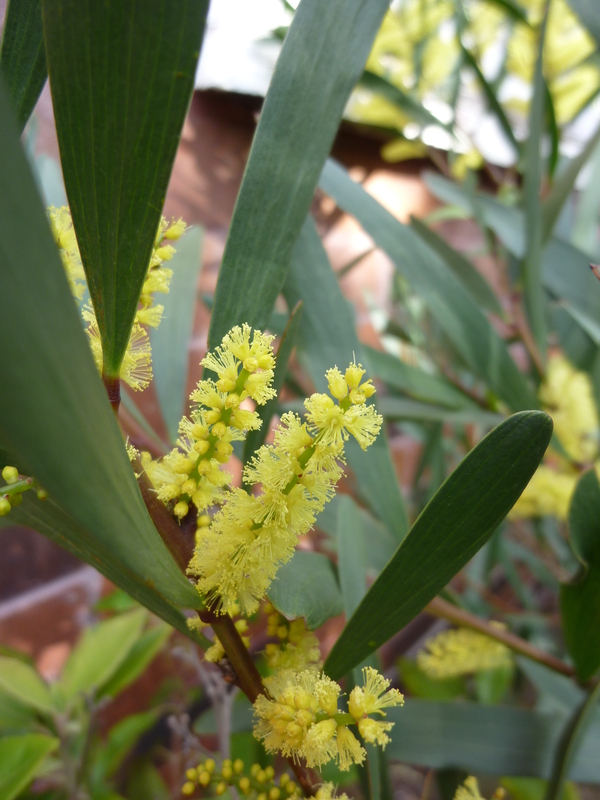 There were also hints that the Coastal Wattle (Acicia sophorae) was beginning to pop out some little yellow delights. 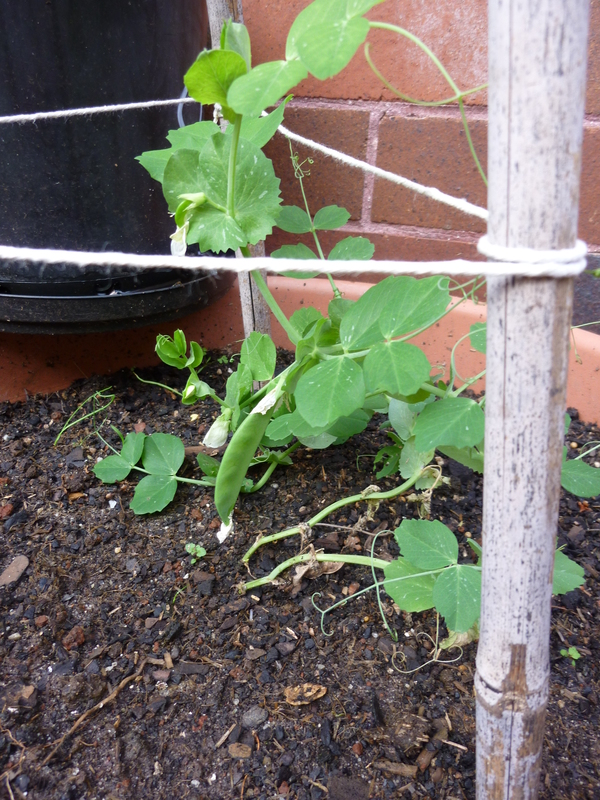 Maybe, just maybe the snow pea was showing signs of uncurling a couple of flowers too but I didn’t expect the blooms to be so bloomin’ advanced! And what about the Paper Daisy? It just keeps going and going. 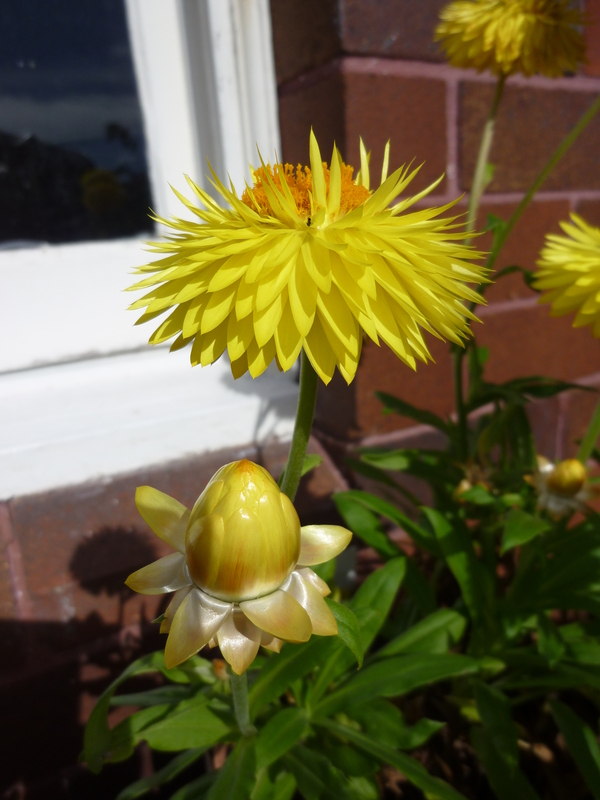 After the recent down pours (yes plural, sometimes it bucketed down with no sign of letting up) I had neglected to venture out to the garden to water (and show my encouragment to) the pot plants. Given the splendid winter weather gracing our suburb I figured today would be the perfect day to get out there and see what was happening. As you know Dave and I live in an apartment and when we moved in we managed to secure ourselves the northside path by the building. It wasn’t being used so we began making it into a garden oasis, filling it with our pots of ornamentals, fruit and vegetables. 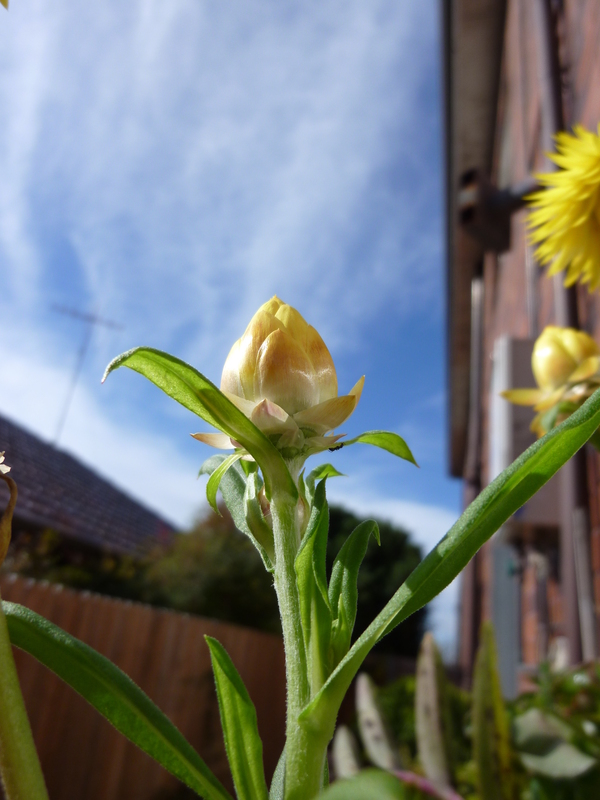 We are fortunate that the neighbouring house is at a lower level than our property, so this means that our little potted gardens receive sun for most of the year. 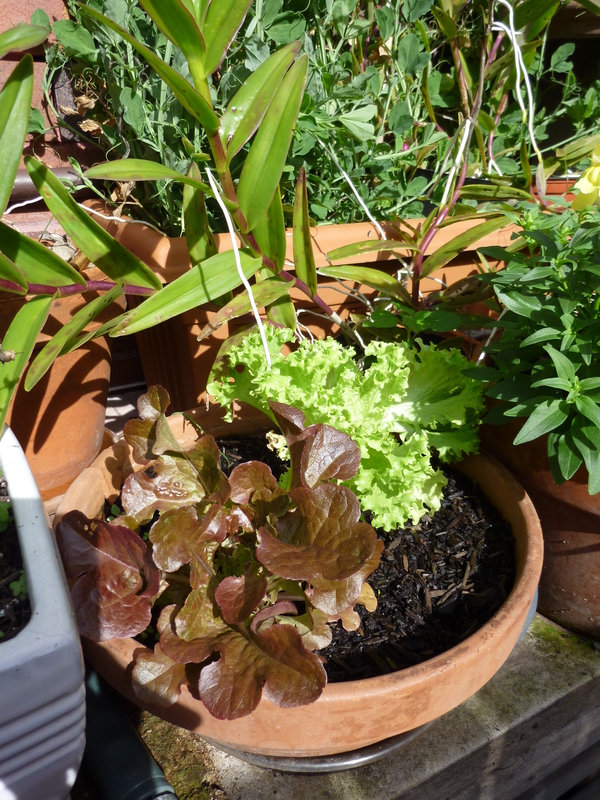 At the moment some of the pots themselves don’t receive much sun but the majority of the foliage does. 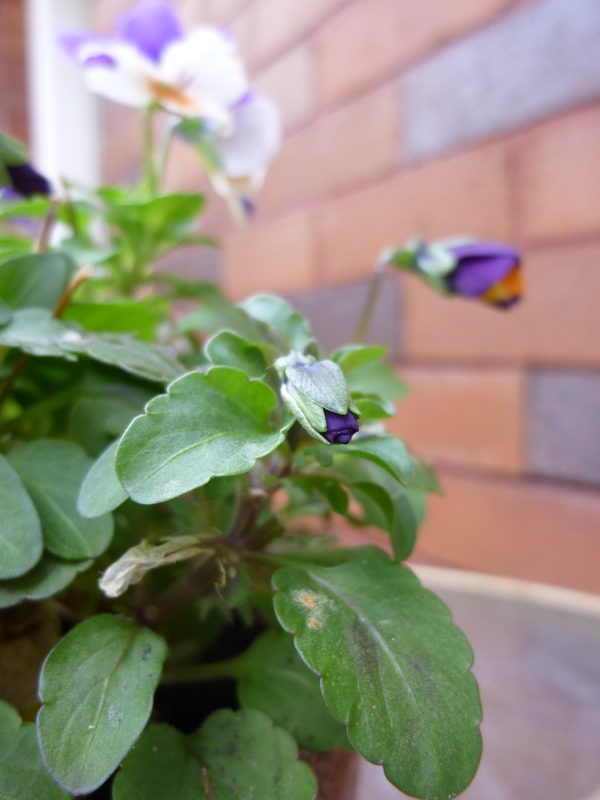 Some plants would perform better with more sun but, every little bit counts I say. 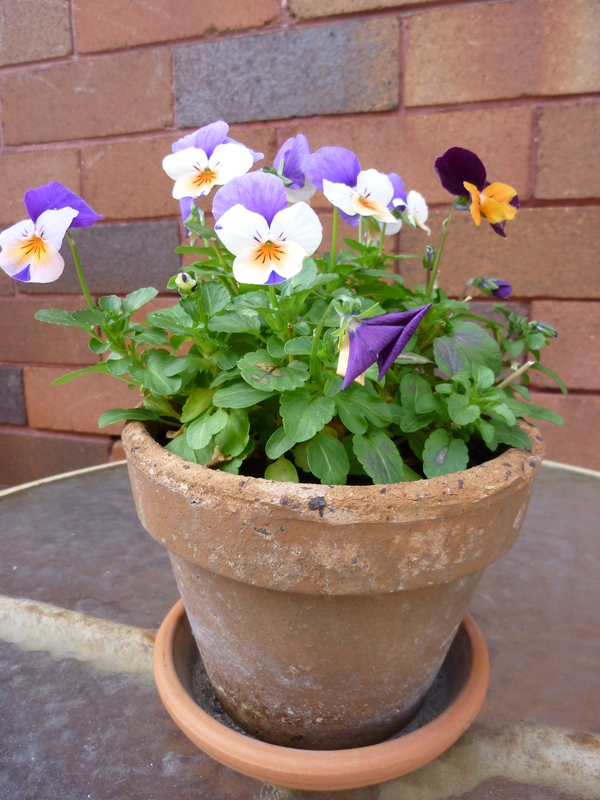 So, out I went and greeting me at the back door was a blooming pot of happy, smiling Viola. 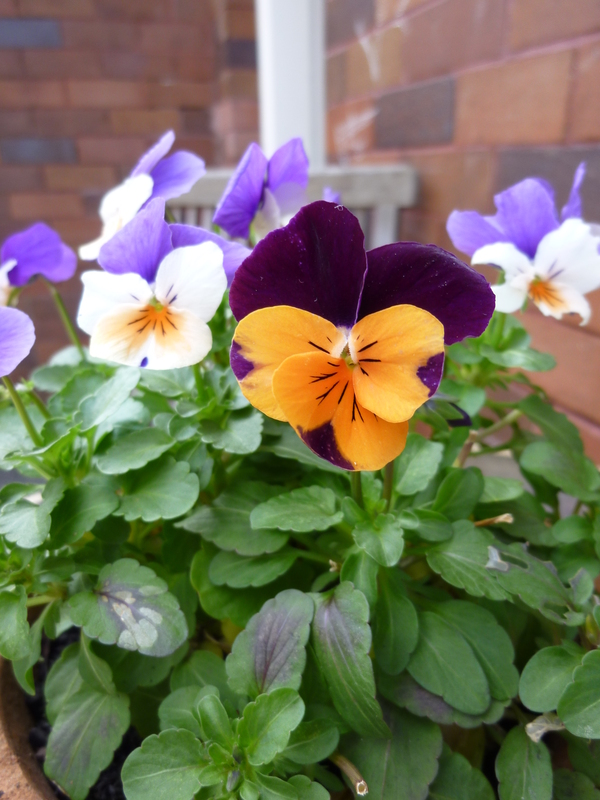 These little gems bring a smile to our faces on even the cloudiest of days (there’s nothing wrong with a coudy day mind you). 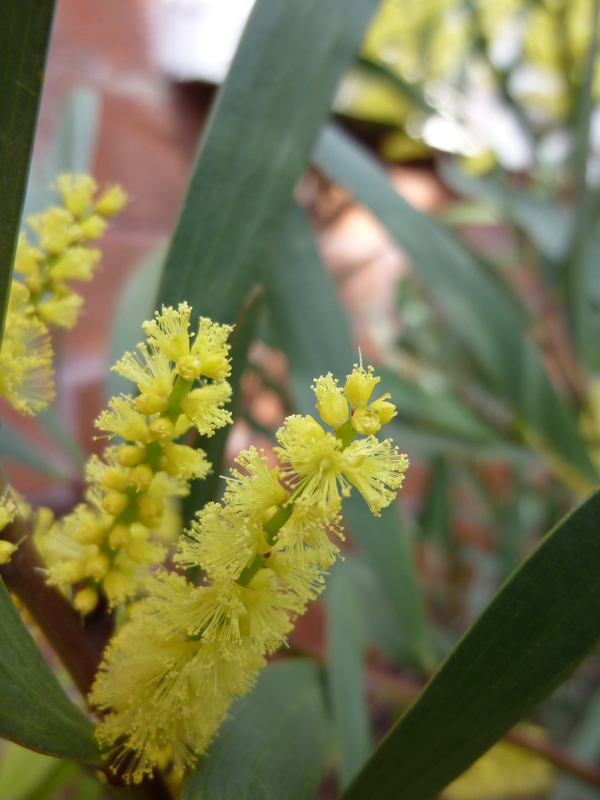 The next discovery was the golden yellow powder puffs on the Wattle. 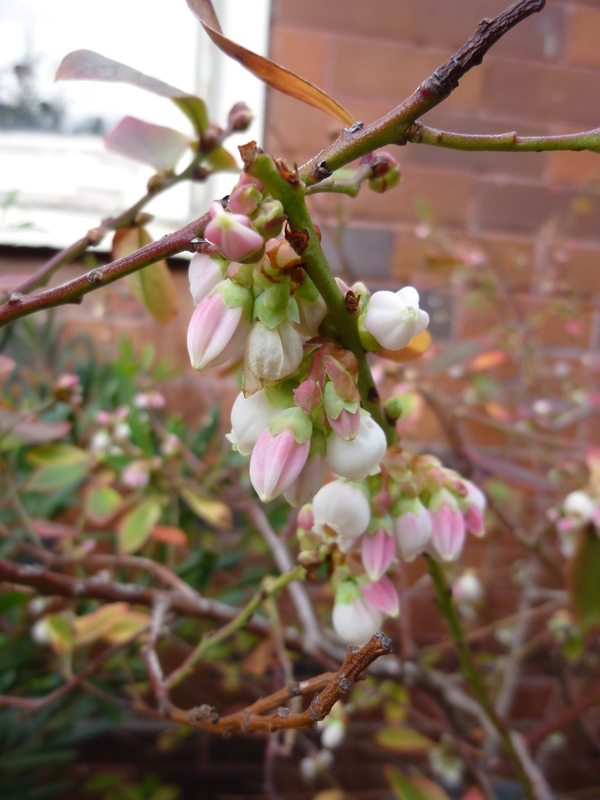 A few weeks ago I had noticed the beginnings of the flowers, they were tiny little lime green balls popping out from the flower spikes on the branches. 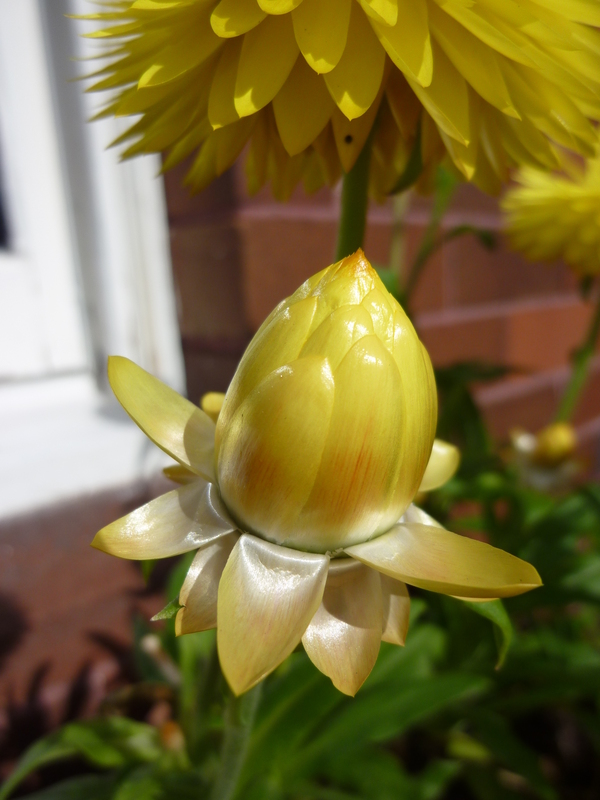 I didn’t think that they would reveal the fluffy golden stamens quite so soon. But they have and in no time we will be harvesting the seeds to roast, grind and add to some delicious cooking. Another lovely surprise was the native Orchids (Dendrobium speciosum). 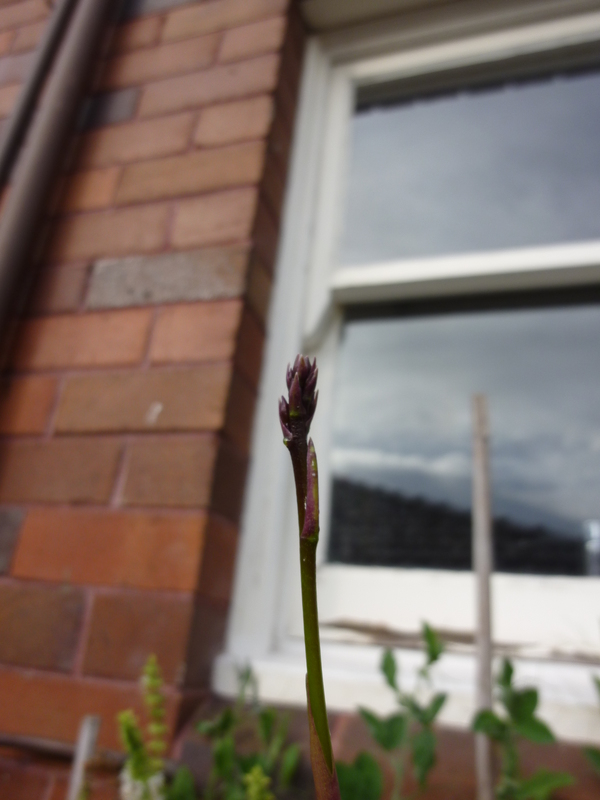 From our kitchen window we can see one of the Orchid pots and for a few weeks now we have been able to see the start of what we hoped would be a flower spike. Dave and I have never had these gorgeous plants flower before so we weren’t sure what to expect or when. 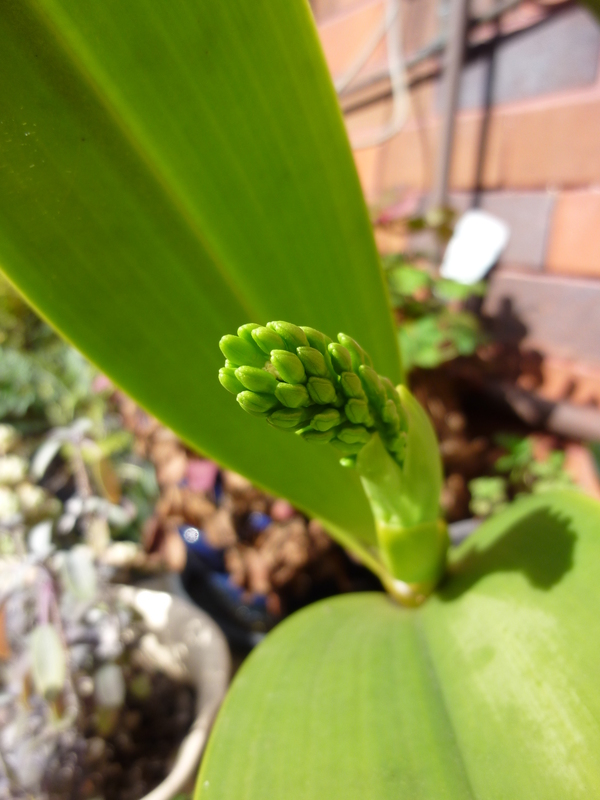 But this little spike has continued skyward to reveal itself as a flower spike (my heart is all a flutter!). 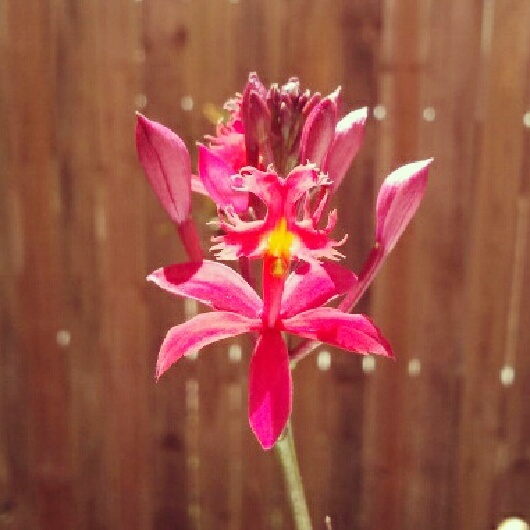 This Orchid is the same as what is growing in my parent’s garden in northern New South Wales and I have fond memories of it bursting with flowers under the Eucalyptus tree in the front garden. 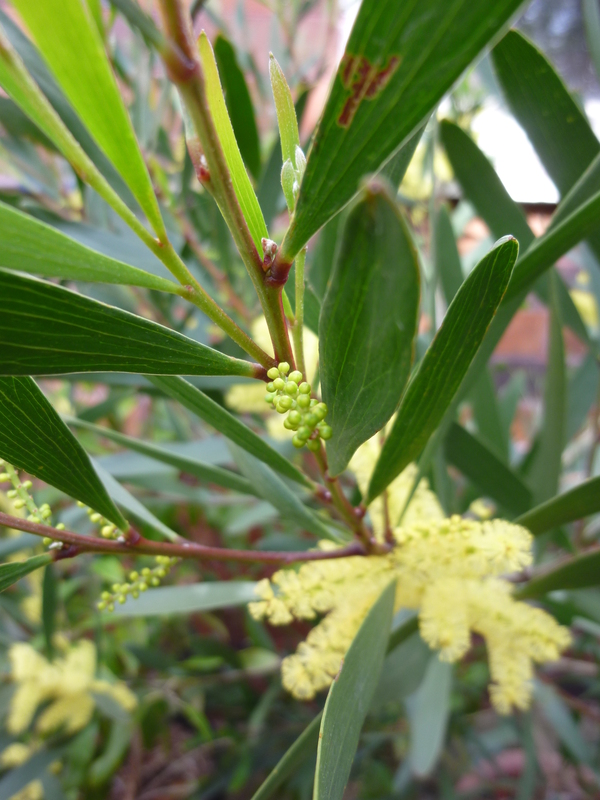 It is very special to me and right now – I can picture its sunny winter position under the tall Eucalypt. 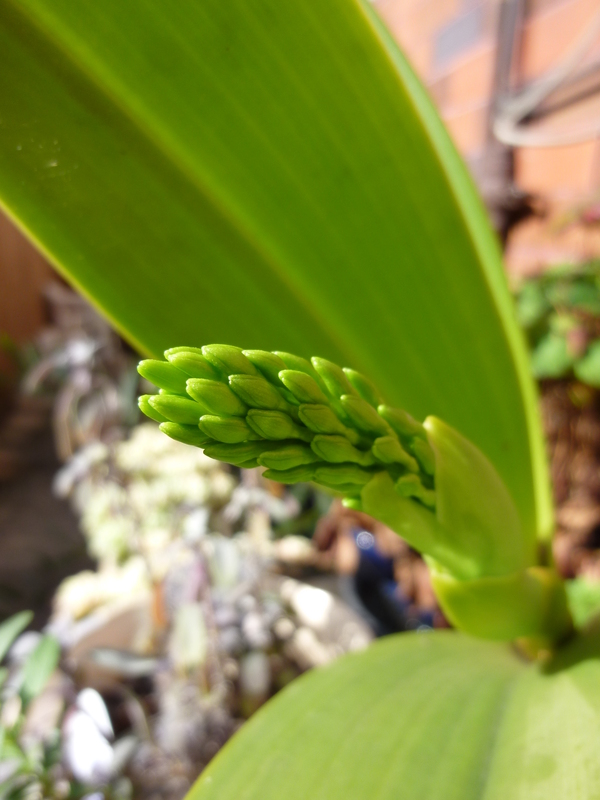 We also have a potted Orchid, which was a gift from a friend and to my surprise it has three flower spikes. How exciting!!! 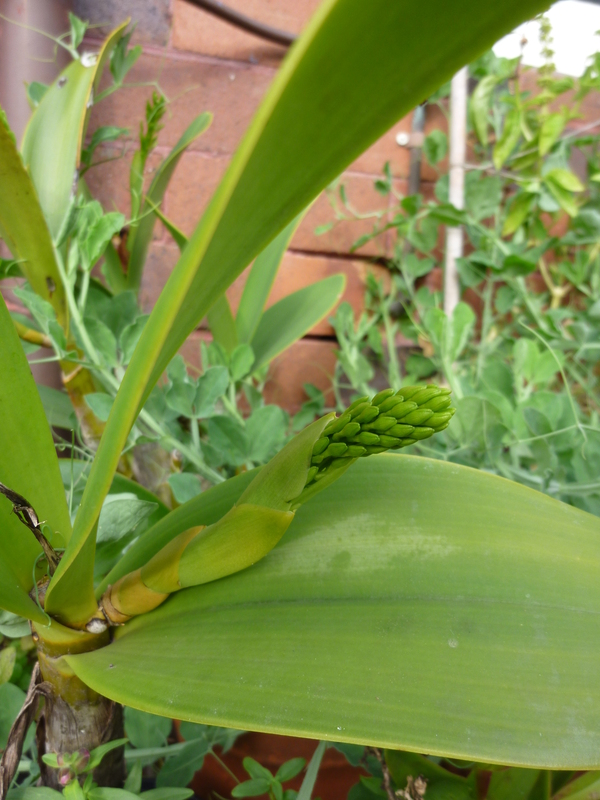 This one seems closer to flowering given that the spike is not quite as tight. Stay tuned. But wait….. there’s more! We also have a number of Crucifix Orchids (Epidendrum spp.) which come from my parent’s garden (you can read about them here). They are in little pots scattered amongst other pot plants and get moved around from time to time depending on the direction of the sun or to make way for new potted additions. Last year one of these flowered the most magnificent pink flowers (pictured below) so this year I am hopeing that the orange one flowers as well as the pink one. 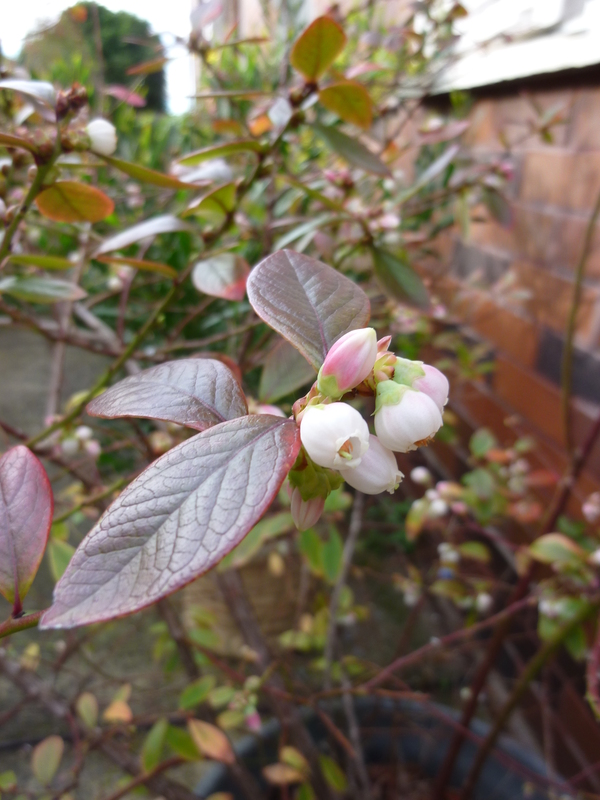 I also think it will be a bumper Blueberry crop if the number of flowers on the Blueberry bush is any thing to go by. However, the nights haven’t been very cold and the blueberry really needs at least two weeks worth of really cold nights to produce delicious tasting berries. Only time will tell in this case. I hope this has inspired you to venture out into your garden today, you never know what delights await you. Have you ever wondered what it would be like to float on a breeze like our feathered friends, finding momentum in the air currents and soaring higher and higher across our city and country landscapes? I have. In flight, effortless, graceful and just a little bit haunting – but I love it. 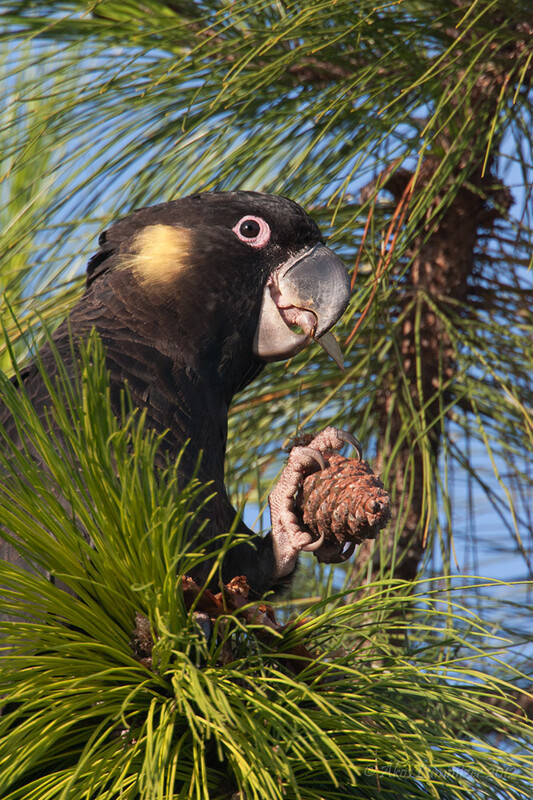 One of the many joys of the Australian landscape is the abundance of birds and their unmatched bird calls. Their striking calls fill the landscape and give you a sense of place, you know where you are… you’re home. Many years ago I left my hot Australian, beachside life and moved to Holland (yes, in Winter). After a few weeks when my brain and body caught up with one another and my mind chatter settled I began to notice how quiet it was. There were no cicadas chirping, no gum trees rustling in the breeze, no birds whistling and definitely no Kookaburras claiming their territory with a big hearty laugh. I realised at that moment how important those sounds were to me, because they were ‘home’. When I hear the Kookaburra laugh, I know I’m home. Those sounds are a soundtrack to my childhood and now the sound track has changed ever so slightly. 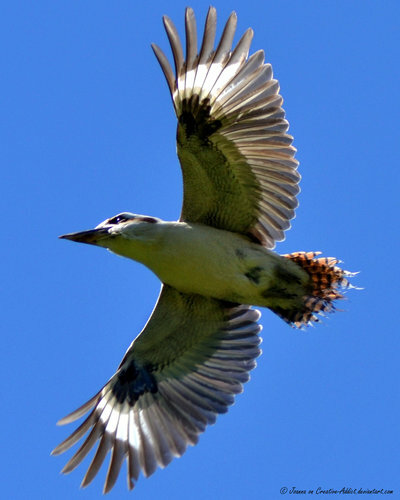 I still hear the Kookaburras and they will forever bring a smile to my face, it is my favourite bird call. 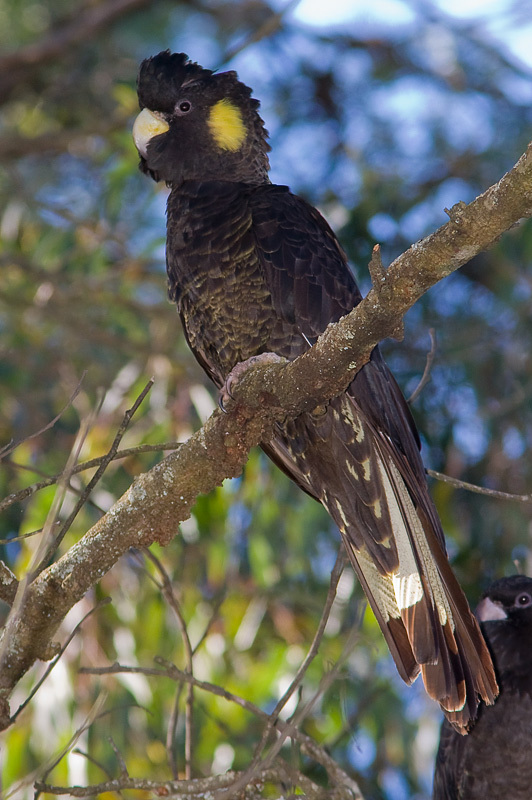 I can hear the rustle of gum trees, I love the announcement of summer from the cicadas, but the addition to my Sydney-life soundtrack is the piercing call of the yellow tailed black cockatoo (Calyptorhynchus funereus). 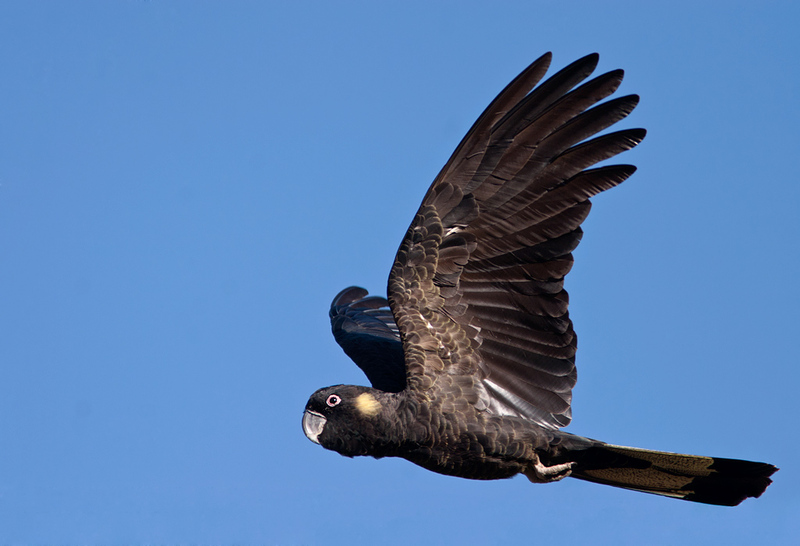 At the moment the yellow tailed black cockatoo is making its presence heard in the skies above my neighbourhood. You can hear them coming with their piercing call high above our roof tops. If I am lucky enough to be outdoors when I hear them coming I’ll search the sky for their location and watch, mesmerized by their effortless soaring and sky high manoeuvres. I’ll wonder where they are headed and watch until they disappear behind the trees and buildings. Being indoors doesn’t mean I miss out on the performance, I’ll head to the nearest window and look, if I can’t find them I’ll go to the next window and the next until they soar across the window frame creating a moving picture. This is a picture of mine from Instagram. 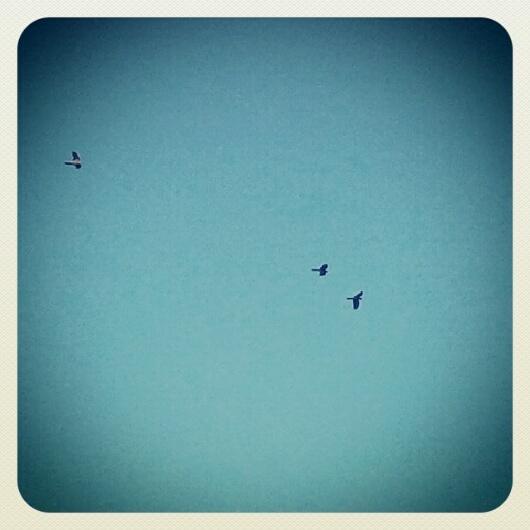 I captured only three birds but there were at least fifty more in the sky above. After their return from hiatus (wherever it is they fly to) to our Sydney skies either Dave or myself will announce ‘their back’ and we both know what it means. Our landscape will be a little more dramatic as they coat our sky in their ununiformed precession. And they will most certainly make me smile as I hear them approach and wonder again where they are headed.